Great advice, instantly. Start changing your life today! Fast Feng Shui for Prosperity is full of great feng shui information about how to remove obstacles to success and increase your cash flow. Plus you get an insider's look at the ba gua (the feng shui energy map) to reveal its secrets for manifesting wealth. This book goes way beyond other books about the feng shui of money, with inside information that can dramatically increase your success. If you are frustrated by a seemingly endless quest for the kind of love relationship you deserve, the layout, furnishings, and energy of your home and bedroom could be part of the problem! 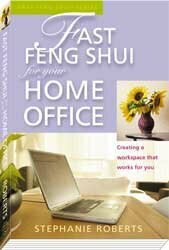 Fast Feng Shui for Singles teaches you, step-by-step, how to analyze your floor plan and decor, diagnose feng shui problems, and adjust the energy in your home so that your living space can better support you in finding - and keeping! - the perfect love you desire. "[Stephanie's] wisdom brings an undeniable contribution to helping single people clear whatever may be blocking their attraction or maintenance of a healthy, enriching relationship... Highly recommended." "I had been trying for over a year to organize closets and cabinets, etc. without much success. Since starting the program, I have de-cluttered every room in my house (in only 4 weeks)!!!!! I learned that I was probably holding on to old emotional baggage that I was not even aware of. I've been able to let that go along with my clutter." Copyright ©2003- Stephanie Roberts. All rights reserved.